Data is from the October 2015 Econsultancy report titled "Digital Publishing: Increasing Advertiser Value Through Data and Identity" in association with Signal. 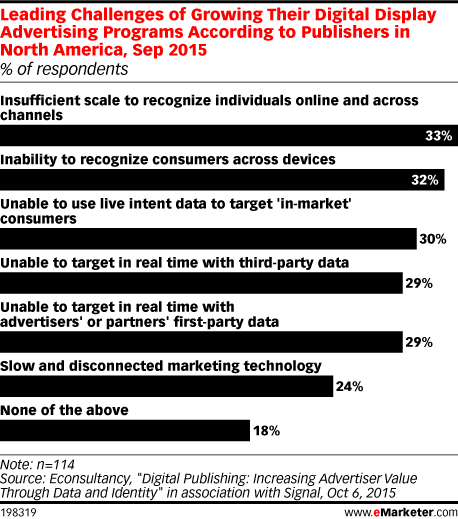 172 publishers in North America were surveyed online in August and September 2015. All respondents were client-side marketers, executives and managers at a publisher with an online presence. Respondents identified their position at their company as board level/business owner (18%), CMO/VP/GM (22%), director (25%) and manager (35%). Respondents identified their company's annual revenue as between $100-$200 million (14%), between $201-$500 million (29%), between $501 million-$1 billion (33%) and $1 billion+ (24%). Respondents identified their company's sector as B2B (25%), B2C (21%) and equally B2B and B2C (54%).